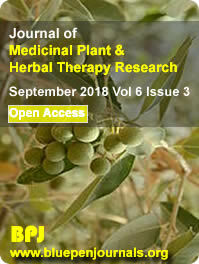 Journal of Medicinal Plant and Herbal Therapy Research (JMPHTR) is an open access academic refereed journal published monthly by BluePen Journals. JMPHTR publishes research articles that report premier fundamental discoveries and inventions, and the applications of those discoveries, unconfined by traditional discipline barriers. All articles published by JMPHTR are published in English. The objective of JMPHTR is to publish the most significant as well as innovative articles in the area of research in medicinal plants as well as herbal therapy research; in other to accelerate the sharing and free-access of knowledge. Clinical Phytochemistry, Ethnopharmacology, Fitoterapia, Herbal Drugs Analysis and Evaluation, Herbal Medicines Research, Isolation and Structural Elucidation of Natural Product, Medication Management, Pharmaceutical Raw Materials Development from Plant Sources/ Utilization, Pharmacognosy, Phytochemical Analysis of Plants, Phytomedicine, Phytotheraphy, etc. Abbreviation: J. Med. Plant. Herbal. Ther. Res.